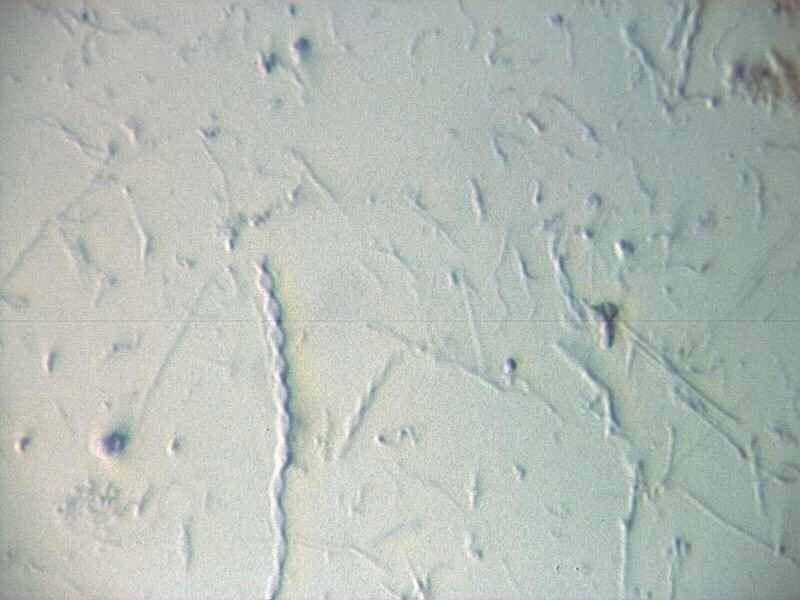 The filaments in this image are without the capping bacteria. Gillionella is one of the filter plugging, iron-loving bacteria. It is very distinctive in that it forms as two entwined, iron hydroxide filaments. The bacteria itself are the paired circular objects at the top of the helix. These are easily displaced during sample preparation or may be missing in the sample due to the fact that it is the collection of filaments that plug the filter and the bacteria may be growing at another location in the system. The most obvious features Gillionella are its orange color in bulk and its helical stock under the microscope. The rate of twisting can be measured by how frequently a flat view of the ribbon is given. The ribbon gives a flat view every 180 degrees. The frequency of these flat views ranges from one every micrometer of length too one about every three micrometers of length. That corresponds to a full twist every two to six micrometers.